Electric motors form the backbone of most industrial and manufacturing environments. Frequency inverters are used to control the speed, torque, acceleration, deceleration, and direction of the motor. The use of inverter has become prevalent in wide range of industrial applications; from motion control applications to ventilation systems, waste water processing facilities to machining areas, and many others. Though frequency inverters offer lower operating costs and higher efficiency, they are not without their problems. According to a recent survey in the United States, motor failures caused by frequency inverters result in hundreds of thousands of hours of unplanned downtime each year. Before looking at methods for troubleshooting frequency inverters, let's review what a frequency inverter is and how it works. A frequency inverter is a power conversion device. It converts fixed frequency sinusoidal alternating current (AC) voltage input, to direct current (DC) voltage, and then to variable-frequency AC voltage, which ultimately controls the speed of induction motors. As illustrated in following Figure, a frequency inverter consists of three elements: rectifier, DC bus, and inverter. The rectifier converts incoming AC power into direct current (DC) power, which is then stored on a DC bus capacitor. The capacitor's function is to reduce the AC ripple and to store the power from the rectifier. The final element of the frequency inverter is referred to as an inverter. The inverter contains transistors that deliver power to the motor. Today, most frequency inverters use insulated gate bipolar transistors (IGBT). IBGTs create an AC waveform using pulse width modulation (PWM) to switch the DC bus voltage on and off several thousand times per second. The resulting variable-frequency AC precisely controls the power delivered to the motor. When electricians encounter a motor failure, typically their first reaction is to use a digital multimeter (DMM) to initiate the troubleshooting process. 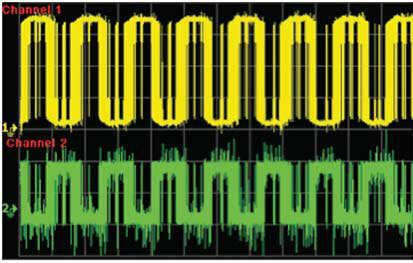 However, in some cases, using a handheld oscilloscope is a quicker way to isolate the exact nature of the problem. It is important to note that not all the oscilloscopes on the market are suitable for electronic power applications such as troubleshooting a frequency inverter. Most oscilloscopes are earth grounded and voltage measurements are referenced to earth ground potential. This attribute can make safely acquiring accurate frequency inverter measurements challenging. 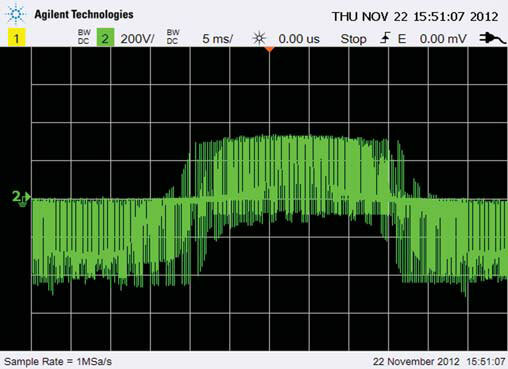 Obtaining floating measurements with a ground-referenced oscilloscope can create a short circuit in the electrical power system and potentially damage the circuit and oscilloscope. When floating the scope without a chassis ground, the mains voltage may appear on the metal chassis of your scope and the measurement will cause inaccurate readings. This is extremely hazardous, since you may accidentally come in contact with it. Using a differential probe may seem to be a safer means of obtaining floating measurements with a grounded oscilloscope. However, this type of probe is expensive and has less bandwidth. Some probes also need an independent power supply. Alternatively, using a handheld oscilloscope with isolated channel input channels is a safe and affordable solution for making floating measurements. The scope's chassis and controls are typically made of plastic, rubber, or another insulating material. Additionally, the scope's internal circuit is designed with high levels of voltage isolation. Motor failures are often related to mechanical breakdowns, particularly motors in high-vibration environments. There are also cases where motor failures are due to electrical failures. Electrical failures such as motor winding burn out or insulation on a motor feeder cable going bad are commonly-seen failures in motors controlled by frequency inverters. 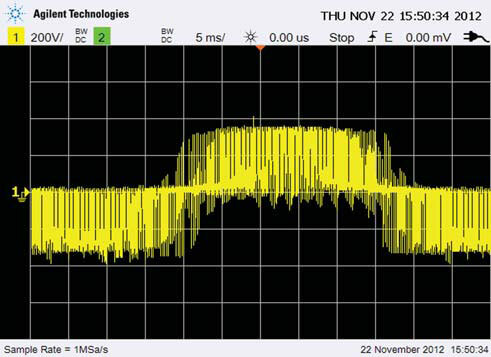 When a fault occurs, using a scope such as the Agilent U1610A/U1620A handheld oscilloscope with isolated channel input channels can help determine if the failure was caused by the frequency inverter, the motor, or a distorted supply voltage. Some of the various tests that can aid in fault identification follow. Modern electronic equipment, such as a frequency inverter, is highly sensitive to voltage variation. That variation can cause equipment malfunctions. Using a safety-rated oscilloscope with electrically isolated inputs, begin troubleshooting by obtaining differential measurements (Phase 1, Phase 2, and Phase 3) on the motor terminals and the frequency inverter inputs. (Refer to Figure on right.) Compare the readings to the frequency inverter display value. If voltage unbalance of over three percent is detected at the frequency inverter input, the fault could be in the utility's power transmission, or the facility's power distribution system. If the unbalance is detected at the frequency inverter output it typically indicates a faulty frequency inverter. A voltage difference can also cause current unbalance. For example, a voltage unbalance of 2.5% can cause a current unbalance of 28%. Such unbalanced currents cause excessive heat in the motor windings, which reduces the motor life span. If the voltage unbalance is within its limits, but excessive current unbalance is detected, the motor could be the source of the problem. However, further tests are needed to validate that conclusion. 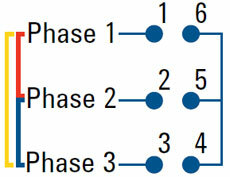 Begin by rotating all the three motor inputs by one position as shown in following Figure. Measure and record the current in each lead in the new setup. If the combination always contains the same motor lead, it indicates a problem with the motor. If the combination always contains the same power line, then the frequency inverter may be at fault. A high current unbalance can also lead to circulating currents in windings that eventually return as shaft currents. These currents can cause overheating in the bearings and lead to premature bearing failure. Additionally, current unbalance can cause nuisance tripping of protective motor equipment and even cause fuse failures. Typically, three-phase motors should not exceed ten percent current unbalance. Fluctuations in DC bus voltage measurements can indicate degradation of the DC bus capacitors in a frequency inverter, since it is the capacitor bank that reduces AC ripple voltage. To help pinpoint capacitor breakdown, use a fully-isolated channel scope and start measuring the DC bus when the frequency inverter is in operation. The bus voltage should be equal to 1.41 times the line voltage. On a 480 V system, the DC bus voltage should read about 676 VDC. The voltage value of AC ripple should be checked as well since its presence on the DC bus can cause current trips in the frequency inverter. The use of IGBTs in power control devices offers many advantages, including improved control of AC motors. However, the fast switching capability of IBGTs, combined with a long cable between the frequency inverter controller and motor, can produce a phenomenon called voltage reflection. These reflected waves are caused by impedance mismatch between the motor and cable. The magnitude and rise time of a reflected wave has a major influence on the dielectric withstand capability of the motor. Under the right conditions, a reflected wave is added to the transmitted wave from the frequency inverter. The voltage spike can exceed more than two times the voltage that the motor can withstand resulting in the breakdown of motor insulation. The highest peak-to-peak electrical stress from reflected wave voltage generally occurs between phases. To measure the reflected wave, use a fully-isolated channel scope to capture traces with three differential voltages across Phases 1-2, 2-3, and 3-1. 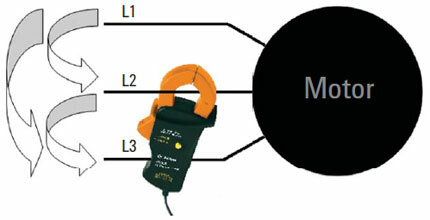 Refer to following Figure for waveform measure at frequency inverter output and at motor terminal. IGBTs allow fast switching in frequency inverters. By applying a small positive voltage between the gate and emitter points of an IGBT, current is allowed to flow from a collector point to an emitter point. However, IGBT power failure is commonly seen in frequency inverters. To identify the root cause failure in the frequency inverter it can be helpful to monitor output voltage from the frequency inverter and the gate control signals of the IGBT. Using a handheld scope with fully-isolated input channels, such as the U1610A/ U1620A, two separate floating measurements can be obtained simultaneously. This measurement method has the added benefit of addressing the safety and accuracy concerns associated with obtaining floating measurements. Engineers and technicians in the industrial setting often need to make floating measurements on frequency inverters. This need calls for a proper handheld scope for electrical service, repair, and installation; an increasingly complex choice. A fully-isolated channel input handheld scope, such an Agilent U1610A or U1620A handheld scope, provides channels-to-DC adapter input isolation and channels to USB connectivity isolation. This allows users to safely connect to signals of widely differing voltage reference levels and obtain accurate measurements. Scopes such as the Agilent U1610A and U1620A are an integrated test tool designed to meet industrial troubleshooting needs. These scopes allow technicians of any skill level to easily troubleshoot all types of electrical and power electronic circuits. my inverter is powered and charging, but does not supply power at the output; instead, there is current on both output terminals without light. How can I resolve the problem?